Following an appearance on BBC2’s The Best of British Takeaways, a programme which follows a similar format to culinary mega-hit The Great British Bake Off but instead focuses on retailers of takeaways foods, Papa’s Fish and Chips of Hull, East Yorkshire was crowned ‘Best in the UK’ by presenter and chef Tom Kerridge. They then took to celebrating the achievement in a rather novel way, by offering customers a full fish supper for just one penny. While watching the show live on March 14th from one of their own premises, joined by special guests including John Prescott, Dino announced that if they were to win, he would offer fish and chips to their customers for just 1p. When they did receive the accolade, Dino made good on his promise. “It’s not about the money for us, we are here to give something back and to celebrate being number one,” said Dino. 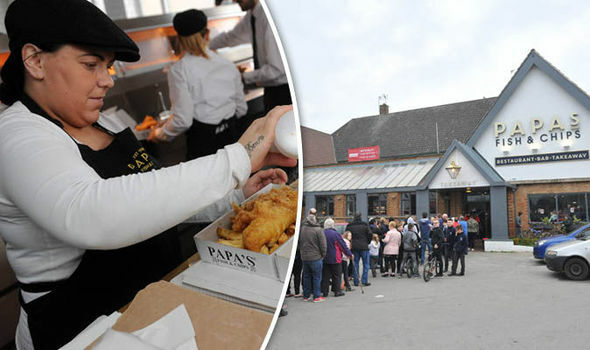 Massive crowds were drawn to Papa’s branches on the day of the offer, with just two branches in Hull serving approximately 10,000 portions, The Express reports. As the 1p supper is usually sold at a price of £4.25, the promotion is estimated to have cost the business around £40,000. As waiting times extended to over an hour, customers were offered the opportunity to jump the queue by participating in a number of challenges. These challenges included making the best batter they could, or eating a spoonful of Chilli American Chip Spice.